One study divides how we cope with anxiety into four categories: Guardians, Integrators, Drivers and Pioneers. Which one are you? What Grinds your Gears? Most respondents agreed that mistakes in the workplace are the greatest cause of stress, promoting cortisol production and causing health issues. “Nothing is permanent in this wicked world, not even our troubles,” remarked Charlie Chaplin’s title character in Monsieur Verdoux, the 1947 murder mystery. For those of us who slave away at the daily grind, we can only hope for the alleviating charm of Mr. Chaplin, whose characters never seemed bothered by the agony of an impending deadline or the crushing voice of an implacable boss. But alas, our struggle is all too real. Even in the 21st century, the great promise of fully automated work is far in the future, leaving many in the real economy with full working days and inordinate stress throbbing at our temples. We all know the feeling. You’ve made a costly mistake in accounting that requires another two hours struggling with an endless spreadsheet. The knot in your stomach. A frank encounter with a coworker who you’d rather not join you on your next outing to the Würstelstand. The anxiety kicks in; the stress builds, accumulates. And it drains you. That little goblin has a name: the hormone cortisol. Increased levels in our body affect our memory, immunity and overall health. It’s a dangerous little bugger. It stems from the adrenal glands to respond to stress or fear, part of the flight-or-fight mechanism. Once a particular task is completed or put to rest, the cortisol retreats and your body goes back to normal. That’s when you feel good all over again. It’s estimated that workplace stress can cost companies over $300 billion in lost productivity and absenteeism – surely the last thing companies want to deal with in the face of fierce global competition. The canny among us have developed methods for coping with stress, but too many are still hopeless at the onset of the mental tension we often simply try to outrun. However, some actually thrive in the face of stressful situations. In fact, they count on it. 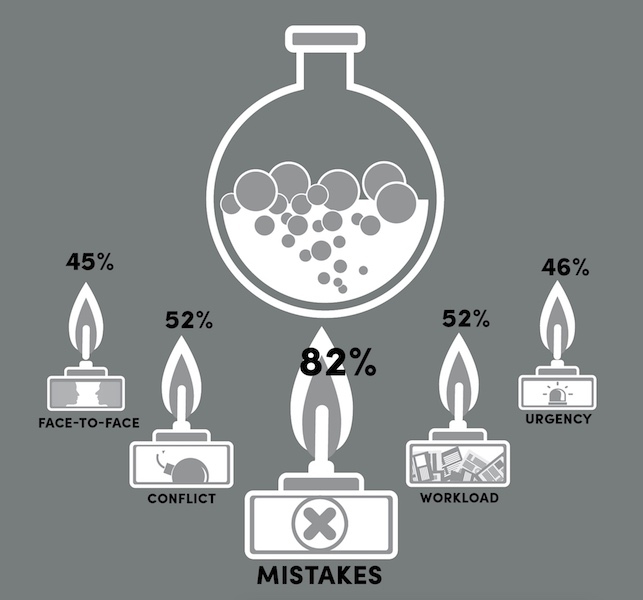 A recent study found that 82% of respondents see errors in the workplace as the single greatest cause of stress, followed by conflict and immense workload, both at 52%, the pressure of urgency for 46%, and for 45%, face-to-face interactions. What this reveals should be no secret to the everyday office worker. Making a mistake and having to fix it creates massive amounts of stress and anxiety. Having tasks pile up leaves people hopeless and makes each attempt at reducing it harder than the last. And don’t even try to handle the stress that comes from butting heads with a co-worker while the deadline clock ticks on. How we choose to deal with this stress hangs on many factors, but researchers believe they can understand several key motivations by personality type alone. One element is “business chemistry”, a unique personality framework trademarked by Deloitte. The frame includes four workplace types: Guardians, who are the methodical warriors; Integrators, the consensus-seekers; Drivers, the logical champions; Pioneers, the spontaneous creatives. These categories break down individuals’ patterns of behavior in career situations. Surely, you’ve known one of each in the lunchroom or around the water cooler. The American Institute of Stress recommends exercise and meditation to best deal with workplace stress. The Drivers and Pioneers, the logical and creative minds, tend to be the individuals who thrive from the pressure of stress. About 61% of Drivers said they’re at their most effective when they’re moderately to very stressed. The same goes for 59% of Pioneers. Guardians say the same at 50% and Integrators at 51%. According to these researchers, these differences arise from the style of work typically engaged in by each type and the mood of the workplace they most enjoy. Drivers and Pioneers are more likely to brush off mistakes and prefer a quicker pace of work. They work alone, act first and ask questions later, and find solutions rapidly. Stress builds before big projects and deadlines, but it’s a welcome friend. The Guardians and Integrators, on the other hand, take each potential decision and analyze it from all its sides, seeking input from others and carefully evaluating mistakes when things go haywire. They seek input from the entire group and any who could be affected. There’s a lot of reflection that the other personality types just don’t embrace. What this study reveals is that there is a delicate balance between useful and negative stress. The latter is unproductive, rendering workers unable to get things done. Today, this is recognized by employers worldwide. And human resources departments have begun to smarten up. Some workplaces have begun offering stress reduction programs as employee benefits, according to the American Psychological Association. The American Institute of Stress recommends exercise and meditation to best deal with workplace stress. Perhaps it’s no wonder then that Headspace, the meditation app, has become a must-have for office workers. Some companies even offer group subscriptions to their employees as a method of reducing stress and anxiety. In Silicon Valley, companies such as Google and Appster offer free rides and free food and beverages to their employees during work hours as a means of reducing stress. Others hold weekly “town hall” meetings to bring employees closer together to talk about struggles they’re facing in their work. Though these methods will temporarily alleviate the stress of the Drivers and Pioneers among us, the Integrators and Guardians will still be left to cope with more than they can likely handle. But perhaps that’s what the machines will do when they finally take over. Why not, now that fact and empathy are out of fashion? At last, send in the robots. There ought to be robots. Stress in the workplace not only affects your concentration but has an overall influence on your well-being. Here’s a short overview. Nervous system When stressed, the body initiates a “fight-or-flight” response, releasing adrenaline and cortisol. These hormones raise blood pressure, heart rate and boost glucose. Musculoskeletal system Under stress, muscles tense up, triggering tension, headaches, migraines and various musculoskeletal conditions. Respiratory System Stress can make you breathe harder and more rapidly – hyperventilating – leading to panic attacks in some people. Cardiovascular system Acute stress can lead to an increased heart rate and stronger contractions of the heart muscle, increasing the amount of blood pumped into these parts of the body. Repeated episodes can lead to cardiac arrest. Endocrine system When the body is stressed, the brain sends signals to the hypothalamus, causing the production of cortisol and epinephrine. The liver produces more glucose to prepare to fight or flee, if necessary. Gastrointestinal system Stress can prompt you to eat much more or less than usual and increase intake of tobacco or alcohol, causing acid reflux. It can also induce nausea or pain, as well as vomiting under acute stress. Reproductive system In men, excess amounts of cortisol produced under stress can impair testosterone and sperm production and affect potency. In women stress can cause irregular menstrual cycles, more painful periods and reduced sexual desire.